Colthurst was the man who shot Sheehy Skeffington without trial on the second day of the rising. He had been promoted for his deeds of wanton cruelty, and only the fact that a royal commission was demanded by Skeffington’s widow and her friends, made it necessary to adjudge him insane as excuse for his behavior, when that behavior was finally brought to light. It was on the occasion of my visit to the moving-pictures that I was annoyed by the knowledge that a detective was following me. His only disguise was to don Irish tweeds such as “Irish Irelanders” wear to stimulate home industry. He had been following me about Dublin ever since my arrival for my August visit. To this day I don’t know why he did not arrest me, nor what he was waiting for me to do. But I decided now to give him the slip. In Glasgow I have had much practice jumping on cars going at full speed. The Dublin cars are much slower, so as a car passed me in the middle of the block, I suddenly leaped aboard, leaving my British friend standing agape with astonishment on the sidewalk. Doubtless he felt the time had come for me to carry out whatever plot I had up my sleeve, and that he had been defeated in his purpose of looking on. I never saw him again. Comments: Margaret Skinnider (1892-1971) was a Scottish revolutionary who fought as a sniper for the Irish republicans during the Easter Rising, being the only woman wounded during the action. The Great Betrayal was the British release title for the Italian four-reel feature film Romanticismo (Italy 1915), a drama of Italian partisans fighting the Austrians in the 19th century, directed by Carlo Campogalliani and starring Tullio Carminati and Helena Makowska. 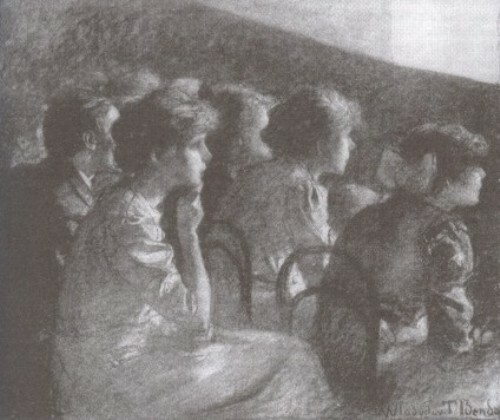 Skinnider dates her cinema visit to August 1916. She left Dublin for the United States, to avoid internment, publishing her autobiography there. This entry was posted in 1910s, Ireland, Memoirs and tagged Audiences, Dublin, Margaret Skinnider, Romanticismo (1915), Talking. Bookmark the permalink.